As someone who never has that much of a personal attachment to an item of clothing, I tend to be pretty good when it comes to sorting items out. Saying this, I've let my wardrobe become a bit of a mess recently, so I decided to have a rummage through to see if I can find any old gems. To my surprise, there were items in there that I've now fallen back in love with. I've done a bit of shopping already, so I thought today I could share with your my top tips on re-discoveirng old style favourites and working them in with new pieces. Monochrome | I've been wearing this ASOS Black Ruffle Jumper non-stop recently, so much so that I'm thinking of getting a back up whilst they're still in the sale. Paired with a pair of jeans and boots, this is the perfect outfit when you want to look like you've made a bit of an effort without doing anything whatsoever. Then I re-discovered this ASOS Mono Jacquard A-Line Skirt that I think I must have bought way back when and by a miracle it's still in stock in one size on ASOS. It's great tucked into the jumper, but I think it'll look lovely paired with tights, dainty pumps and a plain black cami come Autumn. Monochrome items and everyday pieces if still in good condition are always handy to keep as they can be easy basics to wear with other statement items like this Warehouse Leather Look Pink Biker Jacket which I need in my wardrobe (it's the jacket of dreams!). Spruce Up Old Jeans | I'm an avid black jean wearer, but a few ways you can spruce up on old outfit is by adding in colour, whether it's getting creative with iron on patches or slightly bleached for an even more worn in effect. Ripping old worn out jeans at the knees is a great way to save pennies buying them in store and you can tailor them to where you want the slits to sit. Embroidery | Embroidery is a new addition to my wardrobe and my favourite way of incorporating it into the outfits I already wear is by wearing embroidered bags or shoes, as they can easily add colour without looking too OTT. 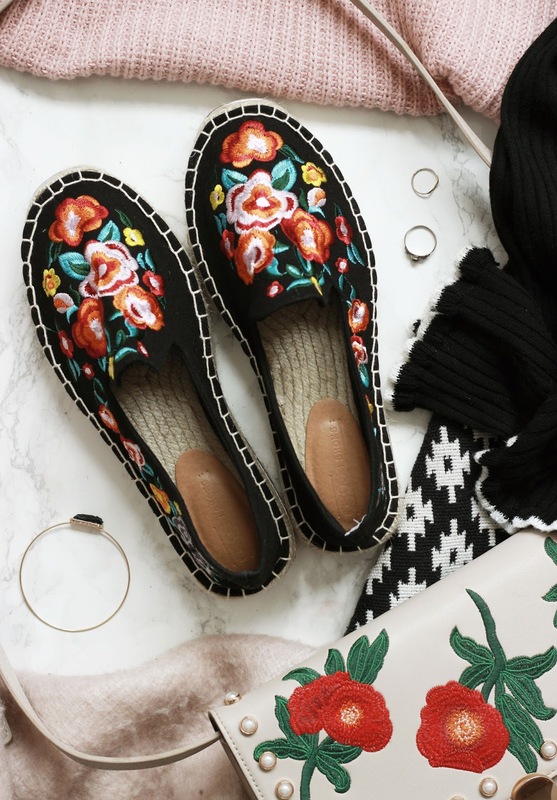 If you follow me on Instagram, you'll know that I got these ASOS June Embroidered Espadrilles the other day and I'm so happy with them as they look great paired with a variety of outfits. My embroidered bag is a firm favourite of mine and one that I've worn pretty much daily throughout the Spring and Summer months too. Going For Basics | As I previously mentioned, I love keeping basics in my wardrobe for pairing with statement pieces, but ultimately it's because monochrome items are where I feel the most comfortable, so therefore I get the most wear out of them. At the moment, pink is a colour that has been trickling into my wardrobe along with Burgundy and Plums. I'm also trying to stop myself buying anything that I know I will only wear a few times, instead opting for items that can easily be transitioned from one season to the next or one's that I know I will continue to wear the following year. Do you ever fall back in love with old style favourites?